The Beard Festival attempts to be a breath of fresh air. Beard Festival was a dream, a vision. The kind of once in a lifetime opportunity’ to do something greater than ourselves. 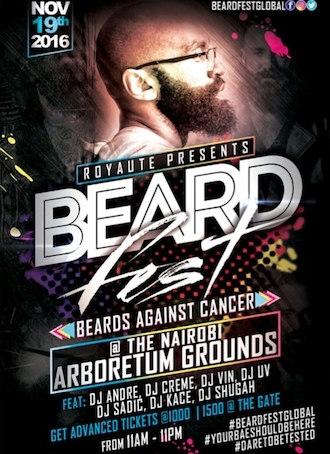 Founded by Royaute Events Group with the idea that many of our friends had these amazing trend of growing different types of beards, so why not put on an outdoor show for all them to come and show them off.The main purpose of Beard Festival is to create awareness of cancer in Kenya. With the worldwide concept of #NoShaveNovember. We often have cancer aware campaigns but it is limited to the types of cancer mostly affected by women for instance Breast and Cervical cancer. The likes of Prostate cancer are given less awareness. There many types of cancer that are not given much attention. November is a Pancreatic, Lung, Stomach, Carcinoid Cancer awareness month.The festivals main aim is creating an environment for everyone to come and have an amazing time socializing and learning about the bearded community and also sensitizing people the goal of No-Shave November also known as Movember, that it is to grow awareness by embracing our hair, which many cancer patients lose, and letting it grow wild and free.